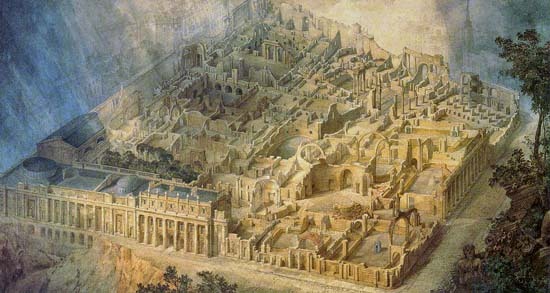 Joseph Gandy, cut away perspective drawing of the Bank of England as a ruin, 1830, John Soane Museum, (official site) London. in both cases the building looks more like a model than an actual building—isolated, with an awkward perspective and an artificial sheen to it. the degree of violence on the buildings is different, almost like watching a before—with ruscha, the fire has just started and the building is still pristine—and an after—gandy doesn’t tell us what happened, we only see the ruins that conveniently reveal the guts of the building, the inside spaces of the bank. furthermore, in ruscha’s image the glossy surface reflections suggest the fake water of a bad model. but this flood has caused no damage—it just makes the building into an island, and emphasizes the museum as a fictitious object. it is fitting that gandy (an architect) is more interested in displaying the spaces of the building while ruscha (an artist), who is more interested in subtle pop references through the use of color. but because of the artificiality of the construction, the images are innocuous—the destruction too friendly and harmless in ruscha’s case, too decorated and precious in gandy’s. although the bank is in ruins, they seem too convenient in their reading of interior spaces. despite their similarities, both images remain anchored in their own eras: in an age obsessed with archeological digs “abroad,” (read: empire) gandy creates a ruin in london. likewise, ruscha turns the museum into the scene of a comic book or an advertisement, and fittingly, the fire can’t burn the blase coolness of this object. in fact, both paintings are so successful in turning the buildings into fiction, that—having never seen either of them—it is surprising to see the bank and the museum are still there. the deliberate artificiality of the paintings is more successful than the violence they depict in casting doubt on the reality of these institutions.